The three winners of the 2018 Tropical 7s Athlete Combine were announced at the official awards ceremony and trophy presentations following the conclusion of 2018 Tropical 7s tournament at the Omni Resort in Orlando Florida. Erin Terwilliger of the Celtic Barbarians (U18 Girls), Jamel McClendon from South Meck High School (U18 Boys) and Erin McFadden from the Central Alberta Predators (University/U23 Women) were the overall winners in their respective age grades. McClendon set a Tropical 7s record by winning his age group for the second consecutive year. Check out below video clip of his combine performance and comparison to USA rugby legend Carlin Isles. The Tropical 7s Athlete combine is open to all athletes participating in the tournament, and runs on the Thursday afternoon before the tournament matches begin. Athletes run through the testing stations at their own leisure and can participate multiple times pending availability -- although fatigue plays a part of maximising results. The ability to execute these key tasks under the pressure of time, space, and fatigue and to do so consistently over a 2-day tournament is arguably unique to rugby 7s. (Pictured is Tropical 7s resident coach Andy Barlow conducting a speed session). 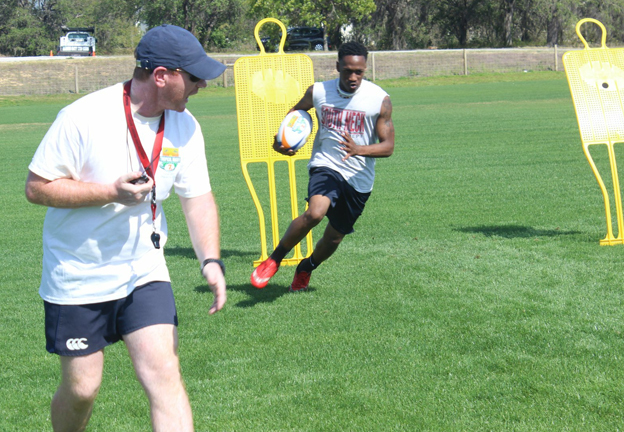 The Athlete Combine provided an opportunity for both teams and individual players participating in the Tropical 7s tournament to benchmark themselves and against their peers across the range of activities. Data from the Athlete Combine is shared confidentially with the team coaches of the players taking part. Representatives from a number of US university rugby programmes observed this year’s participants in action, keeping in line the vision of the Tropical 7s being a showcase event for athlete identification and university recruitment. "We have big plans for future editions of the Athlete Combine," said Tropical 7s Executive Director John Siner. "We intend to grow the participation from coaches scouting players, as well as from athletes whether they are competitin in the tournament or not. We are also looking at at standardised set of skills tests and a database of results such that athletes will be able to use their scores in a wider context."